Good Catch Games’ Simon’s Cat Dash is probably the cutest endless runner to hit the Play Store. With hand-drawn graphics straight out of the original animated series, Dash’s beautiful environment and visuals will make you want to play it again and again. Controls are pretty simple; you will have to avoid obstacles by tapping and swiping. As your cat runs and jumps over objects and platforms, he will come across several new surprises, such as toys, mini-games and lots more! When the game begins, you will be exploring the garden and the house, but as you complete missions, you will be able to unlock more areas and cats. 1. Along with running and jumping to catch butterflies, you also should try earning more points per game to reach score milestones. The score milestone bar can be seen on the top of the screen. Every time you hit a milestone you will get bonus butterflies as rewards. Hit the first milestone and you will get a few, but when you hit the 2nd and then the third score milestone, you will get lots of butterflies. 2. When the game ends, you will be taken to the “Score Rewards” screen, where you can see how many butterflies you have received in that session. You can double your rewards by watching a video. 3. Collect catnips to fill the catnip meter, which is shown on the left side of the screen. When the meter’s full, you will enter Catnip mode, which will double your points for a few seconds. 4. Entering catnip mode 6 times will unlock a surprise level, which has lots of butterflies and fewer obstacles. You will also come across several large butterflies in this level. Make sure to catch all of them as quickly as possible before the timer runs out. 5. Don’t forget to unlock and level up the “score multiplier” upgrade. 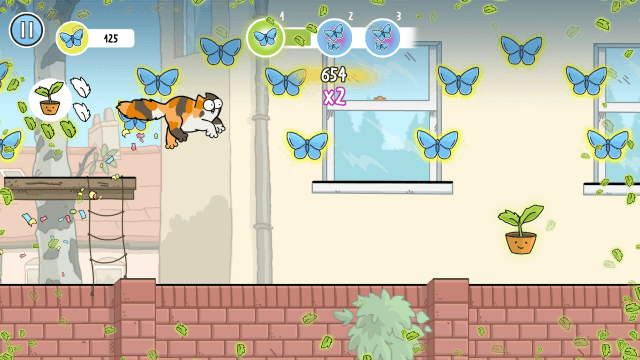 Tap Shop > Upgrades and unlock the first upgrade using butterflies. When you do this, you permanently multiply your points by 2, 3 and so on. Each time you level up this upgrade, you increase your multiplier. With score multiplier, you will reach milestones pretty quickly and get more butterflies. 6. With the score multiplier upgrade unlocked, you will get more points in catnip mode. Usually, points are multiplied by 2 in this mode, but since this upgrade is always active, points will be multiplied by 4. Get the score multiplier as soon as possible when the upgrades section is available for use. 7. You can also unlock and level-up the “catnip multiplier” upgrade if you want to increase the catnip score multiplier. With the help of the above tips, you can easily get 1000 butterflies in every game. Use them to open presents which may contain cat coins. Collect coins and head straight to “collection” and then tap the “common” tab. You must have at least 10 coins to unlock a kitty. Each common cat is worth 10 coins. You can also get coins (including rare purple coins) from free present. Play the game daily to open them. They are available every 12 hours. Obstacles are usually placed on the ground. While you can get past them by tapping or swiping, you should try to avoid them as much as possible. One way to do is to run on walls and jump from one platform to another. Platforms are located high up in the air. You can tap to jump and while in the air tap again to dash if the distance between two platforms is long. The higher to go, the more butterflies you will find, including larger ones. Slipping through tunnels can be difficult if you don’t get the timing right. However, there’s a hint in the form of the quiet gnome who points his finger to the gap. You should swipe downwards the moment your cat gets close to the gnome if you want to easily get past tunnels. While running and jumping, keep an eye on those rainbow colored kitty toys. Collect at least 10 of them to open a present. These toys lie scattered all over a level and are usually found on platforms high above the ground. Part of “Daily Quest”, finding kitty toys is another great way to get surprise gifts.